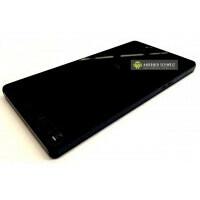 A lot of the talk recently has been about the upcoming Sony Odin smartphone, which is looking like a pretty impressive device, especially if it gets stock Android support from Google like the Xperia S. But, there's also a new device, code-named "Yuga", that's looking better and better as we see clearer pictures of it. We don't know a lot about the Sony Yuga, which is model C6603, although we have seen blurry cam shots that claim to be the same device. We can't confirm that these leaked images are real, so let's all try to stay calm on this one. 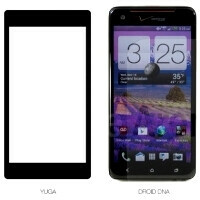 The new rumor has it that the Yuga will feature a 1.5GHz quad-core CPU, 2GB of RAM, a 12MP camera, and a 5" 1080p display. This is slightly different from what we'd heard before which had the Yuga sporting a 6" screen and a 13MP camera. If these images are to be trusted, the device looks to be a fairly sparse design, just a black rectangle. The only stand-out features of the hardware are a glass rear panel, which is odd for Sony, and what looks to be a pretty large silver power button on the side. No word yet on a release window. looks like an lg venice.. 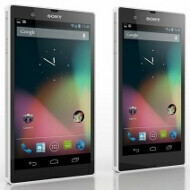 The picture is not clear to judge this thing but I trust Sony design. The only hope is Sony will release this phone before it becomes average. S3 camera made by Sony. They should release this early.. Or else, the competition will be ahead of Sony again. Go Sony! You really have all the potential to take down the beasts. No soft keys means more free space on the screen. In some circumstances it is still better to have capacitive buttons. Until there's edge to edge screens, I don't see the point in not using the bezel for the capacitive buttons. But anyway virtual buttons on the screen are still better than physical buttons. :) I prefer virtual buttons and capacitive buttons over physical buttons. by the time they release this, the competition has already taken over. Sony should release this fast. Samsung will probably release a5 inch sgs4 with cortex a15 by then.